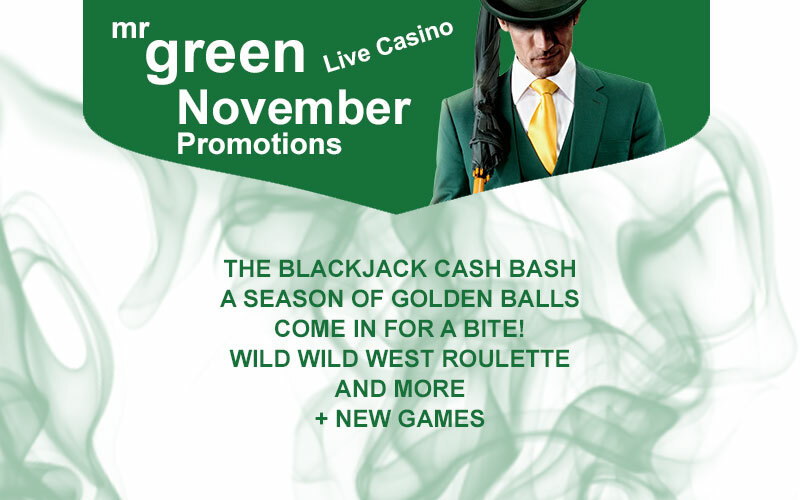 Mr Green Live Casino November promotions start off with The Blackjack Cash Back, A Season of Golden Balls, Halloween Roulette and the Wild Wild West Roulette plus some fantastic new games. Check out all the latest promotional news for this November. The Blackjack tables are packed and Mr Green has €1,000 to give away to his top 20 party goers. A minimum of 10 consecutive hands are required to earn one entry into the ‘€1,000 Bash Draw’ – but the party doesn’t stop there! Players can boogie the night away with up to 50 prize draw entries per day to increase their winning chances. Share a reward of €500 between the top three players with the highest number of points on the leaderboard. The ‘Golden Ball’ feature takes place every 20 games and the player with the highest stake over the previous 19 game rounds wins the ‘Golden Ball’. The top 3 players with the most Golden ball features scores will secure a top leaderboard position and share €500 in Cash. Are you looking for a killer Halloween? A frightening total of 750 ‘Blood Suckers’ Free Spins are up for grabs. Playon Mr Green’s themed Halloween Roulette table and Common Draw Blackjack table. Every day, players can scare up an instant 50 Free Spins on ‘Blood Suckers’ by wagering €20 on the qualifying tables within the same promotional day. Join Big Bug Green and his gang of Desperadoes at his Wild Wild West Roulette table. A rootin’ tootin’ €100 per player is up for grabs throughout the entirety of the promotion. Wager a cumulative total of €20 on Big Bug Green’s Wild Wild West Roulette table. Unlock an instant €5 in Bonus Cash. Yeehaaaw!